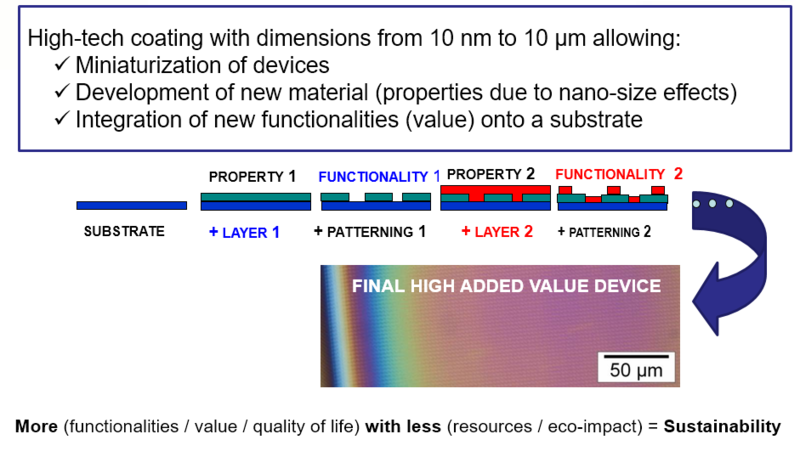 Thin films are a sort of high-technology paint used to add value and to integrate complex functionalities onto a substrate. For instance, they allow miniaturization of devices and enable the study of material properties caused by quantum confinement. Thin film technologies enable efficient resources management (be it at raw material or energy consumption level), more robust devices and enhanced transportability. They are a pervasive technology in today's applications allowing a disruptive approach to many products and business models. Computers, Smartphones, LEDs and photovoltaic applications all rely on thin film technology. Thin film technologies were initiated about 50 years ago, primarily for semiconductor materials that are at the heart of the micro-electronic revolution. Transition metal oxide thin films have been developed more recently to exploit the very wide range of properties of these materials, but are more complex to develop. They are based on elements that are widely available and mostly non-toxic and are very promising for a broad range of applications in which they exhibit a huge potential to replace or complement semi-conductors.